Paranormal Odities: The Things That Go Bump, And get Caught. 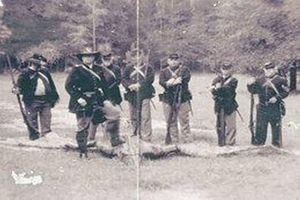 This is a reported Thunderbird, discovered, photographed, and mysteriously lost all in the early part of the Civil war. The thunderbird was believed to be the culprit in many deaths beginning in pre-medieval times. A reported Chupicabra discovered, on a Texas ranch. The ranch owner shot this creature from a short distance. 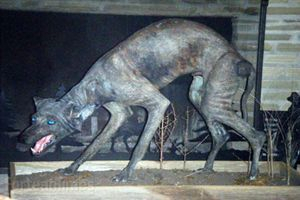 The creature was then stuffed and is now on display in the owner’s living room. Many skeptics believe this to be nothing more than a simple coyote with mange. However, one main distinction allows for questions on this hypothesis. Its bright blue eyes. A typical coyote will have grey/gold eyes that blend with its fur to help in a camouflage look. So cryptid or mange coyote you decide. 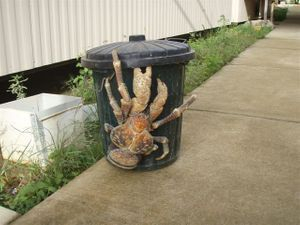 Although not a real cryptid, this coconut crab sure would be a sight to see the next time you have to take the trash out! “These photos arrived in an e-mail this week from Paul Bazzano, a Connecticut resident who has property on Densmore Road in Chelsea. They were taken on Nov. 1 by his brother Gary, during a weekend visit. ‘They were not sure what it was but they were extra careful not to wake him up!’ Paul Bazzano wrote. 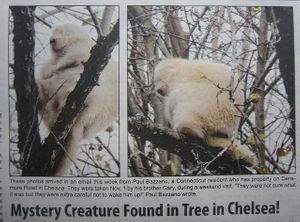 Mystery Creature Found in Tree in Chelsea! Dont forget to check out our Did you know Page!